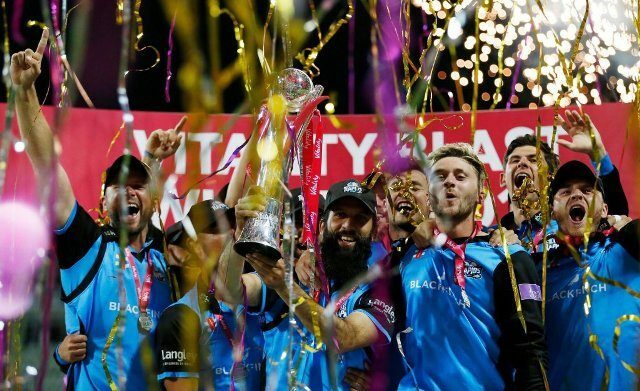 Moeen Ali found himself making headlines on the field as well as off it after he led Worcestershire to the English T20 Blast title with victory over Sussex in the final at Edgbaston on Saturday. A memorable finals day for the England all-rounder started with an allegation, contained in an extract from his autobiography published in Britain’s The Times newspaper, that he was called “Osama” by an Australia player during the 2015 Ashes series. On the field, the Worcestershire captain scored 41 and took two for 16 with his off-spinners, including the wicket of England team-mate Jos Buttler, as his side beat Lancashire by 20 runs in the opening semi-final. He then took three for 30 as Worcestershire held Sussex to a total of 157 for six in the final at Edgbaston — a target the Midlands side chased down with wicket-keeper Ben Cox making an unbeaten 46 and Moeen contributing 41 as they won by five wickets. “I just knew we were going to win today,” said Moeen, whose side owed their place in the final to an impressive semi-final return of four for 21 from 20-year-old seamer Pat Brown.